After attaching to a cell some viruses can then be neutralized by addition of antibodies of certain specificities. It is assumed that viruses whose attachment to cells is inhibited by IgG (Table 1) are not neutralized in this way, and indeed this is a criterion often used to define post-attachment neutralization. However, although mab to VP8*, the trypsin cleavage product of VP4 of rhesus monkey rotavirus, blocks attachment it also has the capacity to cause the release of virus already attached to MA104 cells (Ruggeri and Greenberg 1991). Neutralizing mabs to VP5*, the other cleavage product of VP4 and VP7, do not cause release of virus. With this proviso the addition of antibody after attachment can be and has been used to distinguish between ‘inhibition of attachment’ and ‘inhibition of post-attachment’ mechanisms of neutralization. Viruses listed in Table 3 whose attachment to cells is not inhibited by neutralizing IgG are all candidates for post-attachment neutralization. It is an important concept as it indicates that IgG can act at a relatively late stage of virus-cell interaction. 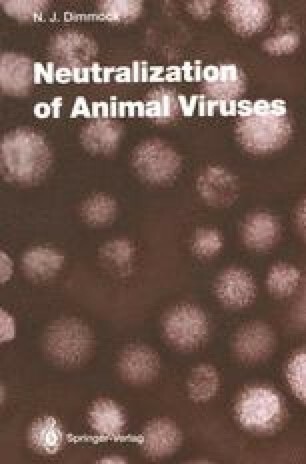 However, there is selectivity of antibody action as post-attachment neutralization of adenovirus was achieved with antibody to hexon but not to penton or penton base proteins (Wohlfart 1988). One obvious factor in the process of post-attachment neutralization is the rate at which attached virus is internalized, as antibody can only neutralize when it is outside the cell (but see above and Kabanov et al. 1989b). For example, NDV which has attached to cells at 4°C can be neutralized by either anti-F or anti-HN mabs, but if infected cells are raised to 37°C susceptibility to neutralization ceases after 90s (Russell 1984). Possibly this is also the reason why IgG added to TGEV after attachment to cells is 1000-fold less effective than when used conventionally (Suñé et al. 1990). Antibody could conceivably act by sterically blocking the nucleation of cell receptors necessary for endocytosis or fusion, stabilizing the structure of a viral protein so that a required conformational change or proteolytic cleavage does not take place or by imposing an unfavourable charge. Alternatively, the relevant antibody may recognize a viral epitope which is revealed only after virus has attached to the cell or an epitope consisting of residues of the viral coat protein and the cell receptor formed de novo, as suggested by Kjellén (1985). Into the former category comes neutralization of adenovirus by IgG specific to the penton base. At pH 7 there is only 50% neutralization, but when virus was held at pH 5 this increased to 94% (Wohlfart 1988): it is inferred that free penton base antibody either binds and is unable to neutralize until the complex is in a pH-5 environment, or is endocytosed together with virus and does not bind or neutralize until the internal milieu of the endosomal vesicle reaches pH5 and causes new epitopes to be revealed.